Over the past year, I have been lucky enough to be on the organising teams of two local user groups. We have organised some very successful, well attended, events, at a variety of venues. Early in the year we had two Macc Tech events in my home town of Macclesfield, organised by myself and Tony Hine. Topics included eSports and Side Projects. At Dot Net North, alongside Jason Holloway, Rick Garner, Oli Newsham and Pete Vickers, we've ran events all year through, with topics ranging from Blazor to Kubernetes to Xamarin. It has been a pleasure to welcome some wonderful speakers to deliver their presentations. Congratulations to Rick, who became a Microsoft MVP this year too. Doubling our MVP footprint, alongside Pete. I delivered one of the talks too, on Free SSL with Let's Encrypt, including a live demo on a Windows Server virtual machine on Microsoft Azure. 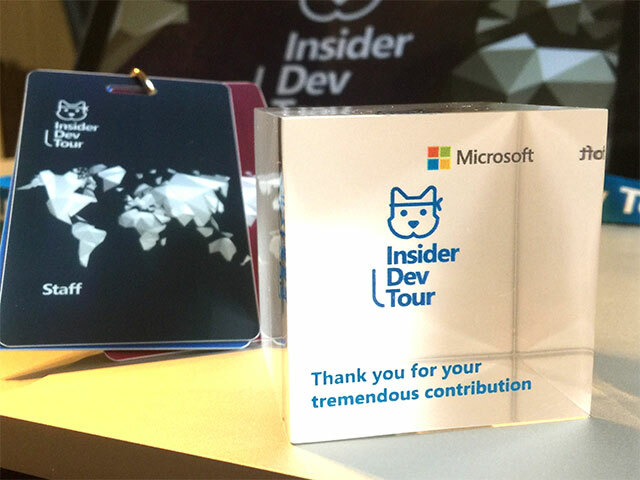 In June I helped out with a special day event, the Manchester leg of the Microsoft Insider Dev Tour. It was a pleasure to do so, and I'm really proud of my 'thank you' gift from Microsoft, pictured. In addition to our own events, I have been lucky enough to attend some third party events this year too. I attended the excellent Microsoft Tech Summit in Birmingham, and in Manchester I have attended IP Expo and Google I/O Extended, to name but a few. We've a lot in the pipeline already for Dot Net North and Macc Tech.. watch this space! I will be hoping to deliver some more talks myself too.